Intended UseHuman MCP-1 / CCL2 ELISA Kit allows for the in vitro quantitative determination of MCP-1 / CCL2 , concentrations in serum, Plasma , tissue homogenates and Cell culture supernates and Other biological fluids. specificalPrinciple of the assay: This kit was based on sandwich enzyme-linked immune-sorbent assay technology. Anti-MCP-1 polyclonal antibody was pre-coated onto 96-well plates. And the biotin conjugated anti-MCP-1 polyclonal antibody was used as detection antibodies. The standards, test samples and biotin conjugated detection antibody were added to the wells subsequently, and wash with wash buffer. Avidin-Biotin-Peroxidase Complex was added and unbound conjugates were washed away with wash buffer. TMB substrates were used to visualize HRP enzymatic reaction. TMB was catalyzed by HRP to produce a blue color product that changed into yellow after adding acidic stop solution. The density of yellow is proportional to the MCP-1 amount of sample captured in plate. Read the O.D. 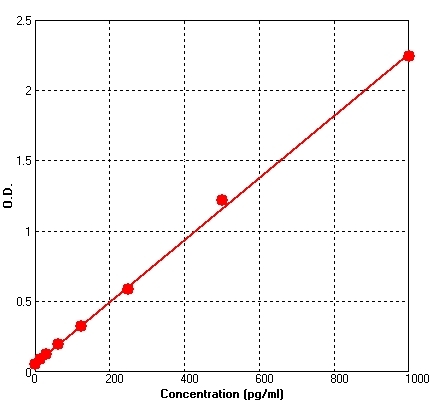 absorbance at 450nm in a microplate reader, and then the concentration of MCP-1 can be calculated. Background: Monocyte chemotactic protein-1(MCP-1), known as chemmkine(C-C motif) ligand 2(CCL2) or small inducible cytokine A2, is a small cytokine belonging to the CC chemokine family. The CCL2 gene is located on chromosome 17 (17q11.2-q21.1) in humans, and spans 1, 927 bases. It has three exons and two introns, and produced as a protein precursor containing signal peptide of 23 amino acids and a mature peptide of 76 amino acids. The predicted weight is 11.025 kiloDaltons (kDa). MCP-1 has been implicated in the pathogenesis of diseases characterized by monocytic infiltrates, like psoriasis, rheumatoid arthritis and atherosclerosis. It induces amylin expression through ERK1/ ERK2/ JNK-AP1 and NF-kappaB related signaling pathways independent of CCR2. Amylin upregulation by CCL2 may contribute to elevation of plasma amylin in obesity and insulin resistance. Inquiry About Human MCP-1 / CCL2 ELISA Kit If you hope to order it or contact us directly, please contact us via sales@biobool.com. We will get back to you in 12hrs,Thanks!